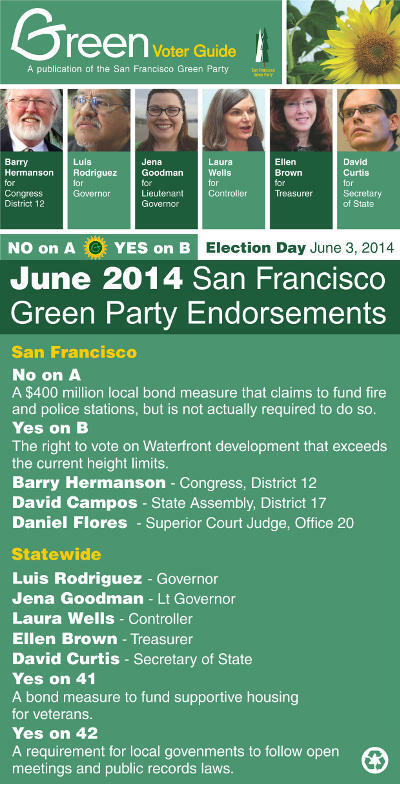 These are the SF Green Party Endorsements for the November 2014 election. We are mailing a postcard like the one below to all our members, so if you can donate to this effort please click the "Donate" link to the left. We also need volunteers to help us hand these out. Our complete Voter Guide is now posted. Click "read more" to see full explanations of the reasons behind our endorsements. 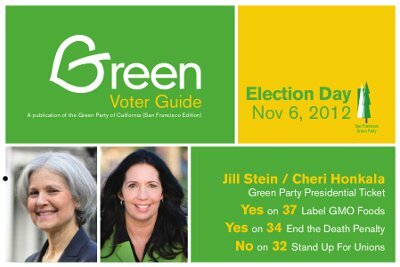 For those who are members of the community radio station KPFA, the SF Green Party has endorsed the United for Community Radio slate of candidates in the Local Station Board elections. Your ballot is due in New York by December 11. It will be competing with holiday mail traffic to get there, so please send it now. SF Green Party member (and former County Council member) Ramsés Téon Nichols. East Bay Green Party members Larry Shoup, Samsarah Morgan, and Kate Tanaka. 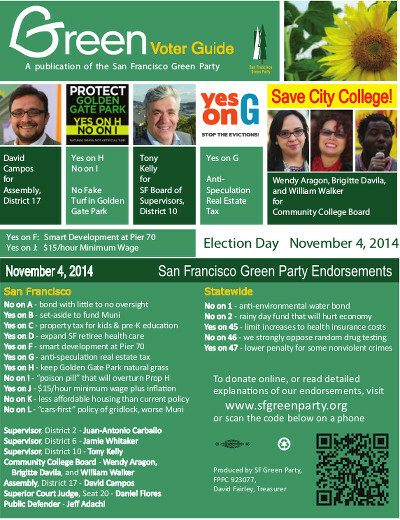 The SF Green Party has endorsed the following candidates and propositions for November 2013. See below for longer explanations. Don't forget to connect the arrow next to "write-in" as well.